Nine years ago I was pregnant with my son, and I was naive enough to listen to the doctors about what was best for my health and the health of my baby. He was born a bit premature, colicky and never slept through the night (at least, not until he was almost 4). He has food sensitivities that he inherited from me, which were not diagnosed in me until 4 years ago, so it’s safe to say that both mom and baby had some undesirable health issues going on. Fortunately today I’m a bit wiser about my health, and use natural solutions for products that I used to readily grab from the shelves. We make our own cleaning products, and/or buy green versions from Whole Foods. We shun plastic as much as possible, and avoid GM foods. And while there’s always more to learn, I’m happy with the steps we’ve made so far. We’re talking about having another baby recently, but I’ve been nervous about both the baby’s and my health. How could I prepare myself so I can have a healthy and happy pregnancy? And what can I do to make sure my baby is as healthy as possible? While I know quite a bit about food allergies, and how to manage life with food allergies and food allergic children, I’m relatively new to the life of natural living and am definitely looking for help with how to have the healthiest pregnancy possible. So I was thrilled to learn that Kristen from Food Renegade was writing a book about having a healthy pregnancy that addresses getting your body ready for a healthy pregnancy, and helps with natural solutions for some of the little hiccups that occur along the beautiful journey of pregnancy. She’s been blogging about healthy living for years now, and she’s a pro at the ins and outs of natural living solutions. She’s a nutrition & wellness coach, and a passionate advocate for “real food”. I admire Kristen’s desire to educate us on healthier living through her own personal journeys and her willingness to share her knowledge as a nutrition and wellness coach with us for free. Her book will be an instant classic for those looking for a healthy pregnancy, safe and natural delivery and a healthy and happy baby. 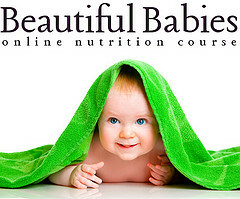 And if you hurry, you can pre-order her book Beautiful Babies from Amazon by March 18th will ALSO receive a free enrollment in her Beautiful Babies Online Nutrition Course (a $199 value)! Do you want to know how to avoid morning sickness? Do you want your child to never have an ear infection? Do you want a beautiful birth? You can find out more about Kristen’s e-course here, and if you do pick up a copy of her book, be sure to follow the instructions below to get your free enrollment in her Beautiful Babies Online Nutrition Course. To receive their free enrollment, customers must email Kristen a copy of their Amazon sales receipt to. When she verifies your purchase, she will email you a coupon code for the free enrollment! And if you want to try your luck at winning a FREE copy of the Beautiful Babies book (no access to the free online course with this giveaway) you can enter using the widget below. Please share your comments on the book once you get your copy with us below, and good luck in your pregnancy journey!